She was thorough, thoughtful, knowledgeable, and professional! She took time to listen, proposed other possibilitiesfor my condition and ordered tests to help determine the cause. She was thorough, thoughtful, knowledgeable, and professional! She took time to listen, proposed other possibilities for my condition and ordered tests to help determine the cause. Overall, I’m very happy with my visit. I’m a new patient, so I understand that the wait time is more thannormal, especially since I had to complete my new patient forms. Overall, I’m very happy with my visit. I’m a new patient, so I understand that the wait time is more than normal, especially since I had to complete my new patientforms. 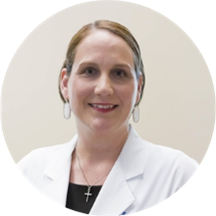 Laura Sinclair is a skilled and concerned nurse practitioner caring for the San Antonio, TX community. Ms. Sinclair attended the University of Texas, Arlington, where she earned her master’s degree in family nursing. Ms. Sinclair is a part of MedFirst Westover Hills Primary Care Clinic. She is also a member of the American Association of Critical-care Nurses, the Texas Nurses Association, and the San Antonio Nurses in Advanced Practice. Patients trust Ms. Sinclair expertise because she consistently provides high quality care that leads to positive and lasting health outcomes. She did not make me feel rushed. She was friendly and professional. She was the first one to answer my rare questions on my hypothyroid illness and blood work. She pointed out my sore muscles and specific nerves could be associated with my illness in ways I never thought of before. She isa very informative doctor and is shares very important pieces that can leave a big impact on your health. Nice office environment and friendly reception staff. Laura Sinclair and the nursing staff were also personable and very professional. Normally I get bad anxiety about office visits but they did a good job of making me feel calm and explaining everything to making me feel more comfortable. I recieved very good care. Fast service. Me. Sinclair, was awesome!!! I'm very happy to have had her as my doctor this afternoon. I can not express how patient and helpful she was with me. She has been the best doctor so far that I have ever had.I hope to continue see her when it come to my health and services. She definitely deserves to be praised!!! Pls thank her once again for me. You are definitely blessed to have her in your practice. Thank you!!! NP Sinclair was very professional and thorough in her evaluation of my current health needs. She's very good about looking at the whole life of a person instead of just a very narrow "let's look at these numbers" approach. The front desk, nurses and Dr. Sinclair were very professional and friendly. Dr. Sinclair was very thorough and listened to my concerns and asked good follow up questions.